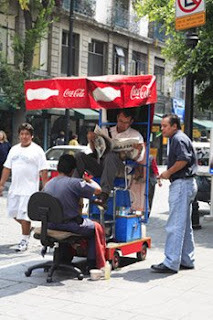 There is no shortage of shoe shiners in Mexico City like the one you see here. In fact you’ll find them all over Mexico, typically in a city or town’s zocalo (main square) and public parks. I am always compelled to photograph shoe shiners when in Mexico. Perhaps it’s because this same photograph could have been taken 50 years ago with little difference other than the clothing worn. It’s a wholesome scene of a time gone by that still exists. I like the way the mobile booths provide a comfortable place to sit and shelter from the elements. When is the last time you had a good old-fashioned shoeshine? Thank you! So true about India which is dear to my heart (my husband is from Delhi) I seem to photograph outdoor barbers a lot when I'm in India for the same reasons I photographed the shoe shiners in Mexico. You've given me an idea for a future post. When I lived in Mexico, I would often get my shoes shined in a little colonial town called San Miguel de Allende. It's not very common for women to have their shoes shined and men would often stop to take a long look at the blonde gringa in the shoe shiner's chair. My leather shoes and boots have not looked as good since! Now that you mention it i does typically seem like a men only activity. I have had the opportunity to experience Mexico in ways I might not have thanks to you! Funny how Coke and Pepsi advertsing pop up ALL over the world. true. I like the fact that you can still get the glass bottles in other parts of the world.